Currently trading as an established B&B, Ardlinnhe offers an opportunity of a turn key business for its new owners with the potential to increase the turnover with the use of the garden villa which is currently used privately for family. Built in the late 80s, the property has been modernised over the years to a very high standard with the addition of a two bedroom villa which was built in 2008. 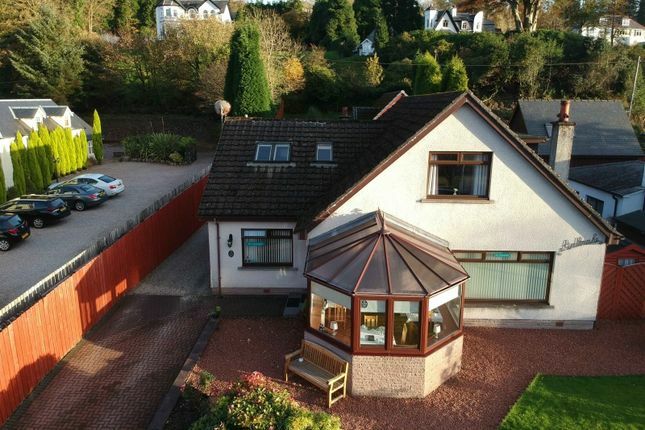 Both properties are in very good order throughout and well presented to the market, Ardlinnhe would also make a superb large family home with the added benefit of the villa for additional accommodation or as a holiday/letting business. Outside there is an elevated garden area which is mainly laid to lawn and includes a mixture of shrubs and plants, the garden area that surrounds the house and villa are hard landscaped which provides ample parking and easy maintenance. The main house and villa offer great flexibility and a lifestyle in a much sought after location with the potential to expand the business turnover immediately with the letting of the villa. • Loch Views. Desirable Location. • Conservatory currently used as guest’s breakfast room. • Large owners lounge with feature fire and surround with elevation to the front. • Large modern kitchen with a range cooker and an excellent range of base and wall units. • Large utility room with full utilities and access to the rear. • 3 Letting Bedrooms with en-suite facilities on the first floor. • 3 Private owners bedrooms on the ground floor. • Ample private parking for owners and guests. • Generous modern accommodation on two floors. • Two ground floor bedrooms with an en-suite bathroom and en-suite shower room. • Spacious lounge on the first floor with double formation windows. • Modern fitted kitchen on the first floor with ample base and wall units, including a range cooker. • WC facilities on the first floor. • Central heating and full double glazing. This sale provides a turnkey opportunity for owners looking for a home in a desirable location, with the added benefit of an income. Viewings are by appointment only. The contents to run the business are available, a list is available on request. Accounts are available on request by interested parties only.